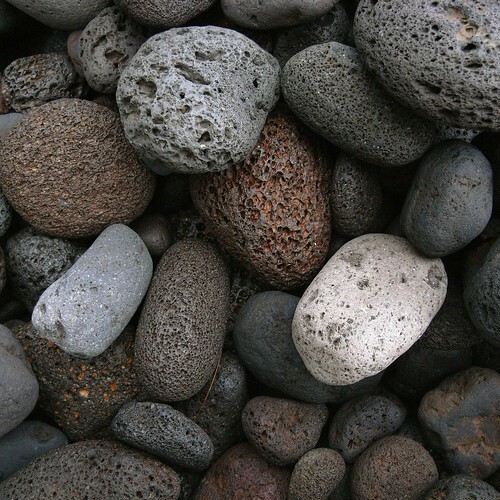 Beach Stones, Laupahoehoe, originally uploaded by Eric Jeschke. The shapes, colors, textures and contrasts of these stones are fabulous. Wonderful job capturing it all. Great textures in those stones. It was an interesting day. The photograph was taken on an outing with the local photography club. The day started out rainy and wet, and most people bailed out pretty early. Those of us who held out were rewarded with some very interesting light later on. At this particular location, the lava is of a very interesting type: very hard and resilient to the wave action (which is very intense here). As I was walking around the beach, the colors (first) and then the textures of the stones caught my eye and I began playing around with different compositions. This is the one that I liked best. The light was just after sunset, and I feel the gx-100 did a decent job of capturing the tones present.